I have embarked on a little quest to learn other database platforms (especially NoSQL) as more and more of our clients at Pragmatic Works have them in their enterprise, and want to be able to import data from them into their SQL Server data warehouses using SQL Server Integration Services (SSIS). While I found several articles that showed how to do so, these were outdated due to changes in the MongDB C# driver. After quite a bit of effort figuring out how to get this working, I thought I’d pass along my hard fought knowledge. First, I assume you are familiar with MongoDB (http://www.mongodb.org/) and SQL Server (https://www.microsoft.com/en-us/sqlserver/default.aspx). 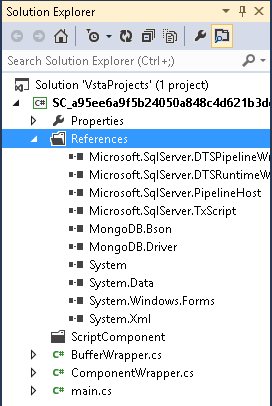 In my examples I am using SSIS 2012 and MongoDB 2.4.8, along with the C# driver version 1.7 for MongoDB available at http://docs.mongodb.org/ecosystem/drivers/csharp/ . First, download and install the C# driver. This next step is important, as there was a change that occurred with version 1.5 of the driver: the DLLs are no longer installed in the GAC (Global Assembly Cache) automatically. They must be there, however, for SSIS to be able to use them. Note the “ quote marks around the path are important for the CMD window to correctly separate the gacutil program from the parameters. 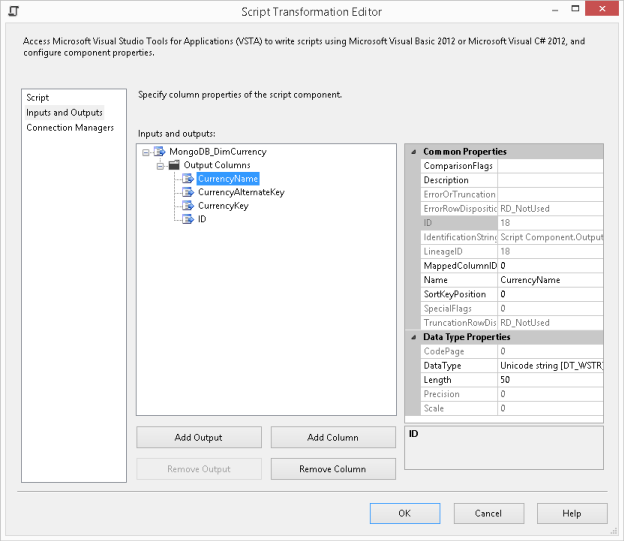 Once that is done, create a new SQL Server Integration Services project in SQL Server Data Tools (SSDT), what used to be called BIDS in SQL Server 2008R2 (and previous). Put a Data Flow Task on the Control Flow design surface. Then open the Data Flow Task for editing. 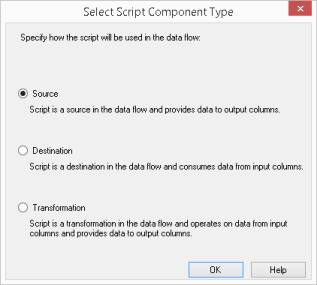 Next, drag and drop a Script Component transformation onto the Data Flow design surface. When prompted, change the component type to Source. 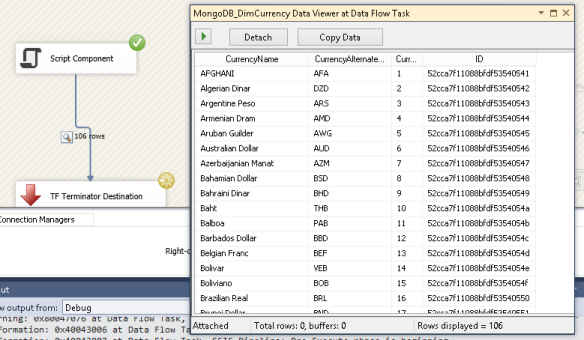 I renamed the output from “output” to “MongoDB_DimCurrency”. I then added four columns, CurrencyName, CurrencyAlternateKey, CurrencyKey, and ID. Make sure to set CurrencyName, CurrencyAlternateKey, and ID to “Unicode string [DT_WSTR]” Data Type. Then change CurrencyKey to “four byte signed integer [DT_I4]”. Now return to the Script page and click Edit Script. In the Solution Explorer pane, expand References, right click and pick Add Reference. Go to Browse, and navigate to the folder where the MongoDB C# drivers are installed. On my system it was in C:\Program Files (x86)\MongoDB\CSharpDriver 1.7\. 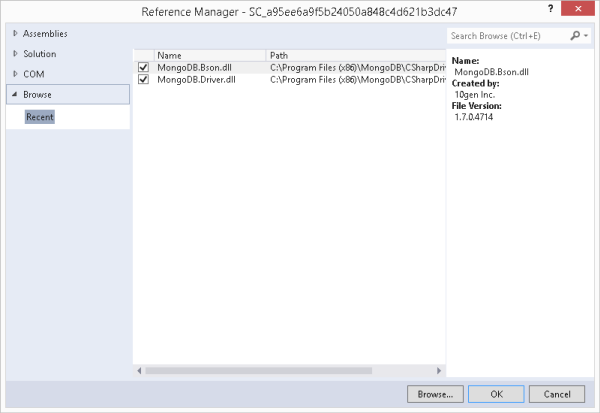 Add both MongoDB.Driver.dll and MongoDB.Bson.dll. I start by defining a connection string to the MongoDB server, followed by the database name. I then create a MongoClient object. Note the MongoClient is the new way of connecting to the MongoDB server. In earlier versions of the C# driver, you used MongoServer objects. I then cycle through each document in the collection “dbo.DimCurrency”, using the FindAll() method. For each item I use the AddRow() method to add a row to the buffer. In order to find the proper name for the buffer I went to the Solution Explorer and expanded the BufferWrapper.cs file. This is a class created by the script transform with the name of the output buffer. For each column in my outputs, I map a column from the document. Note the use of the ternary operator ? : to strip out nulls and replace them with empty strings. String columns you can map directly from the document object to the output buffers columns. The CurrencyKey column, being an integer, had to be converted from a string to an integer. To make it simple I created a string variable to hold the return value from the document, then used the Convert class to convert it to an INT 32. Once you’ve done all the above, validate the code by building the code. If that all checks out save your work, close the code window, then close the Script Transformation Editor by clicking OK.
A few final notes. This test was done using a MongoDB document schema that was flat, i.e. it didn’t have any documents embedded in the documents I was testing with. (Hopefully I’ll be able to test that in the future, but it will be the subject of a future post.) Second, the key was the registering of the DLLs in the GAC. Until I did that, I couldn’t get the package to execute. Finally, by using the newer API for the MongoDB objects I’ve ensured compatibility for the future.